Modern Chrome Radiator Valves - Only £15.99! In stock now for just £15.99 including VAT! Hurry while stocks last! Designed to compliment any radiator or heated towel rail in our range, these minimalist pairs of Angled or Straight radiator valves feature a high quality chrome finish, for added durability and luxury style. With a modern design and hard-wearing chrome finish, these valves create a high-end look at an affordable price. These superb radiator valves combine stylish modern looks with unbeatable quality. This high quality pair of matching Angled or Straight minimalist chrome radiator valves is available at an amazingly low price from VIP Bathrooms. Designed to complement our range of heated towel rails, they are beautifully engineered to integrate into any modern or minimalist bathroom. Sleek design and functionality mean our heated towel rail and radiator valves meet the needs of any bathroom setting. These excellent pairs of radiator valves are available in a choice of either Angled (for wall mounted radiators) or Straight (for floor mounted radiators). Both are of equally high quality and both are available at the same great value price of just £15.99 including VAT. When ordering, please specify your preference from the drop-down menu near the bottom of this page. 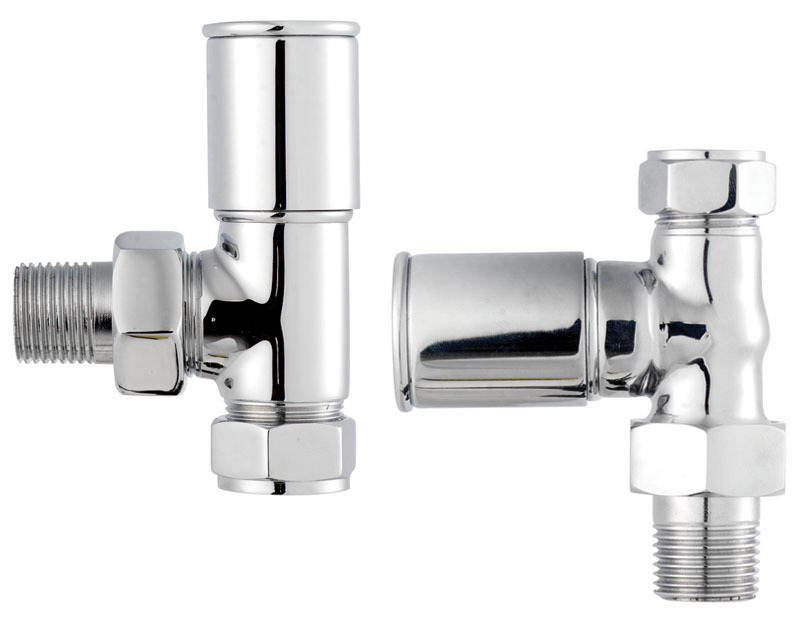 These Modern Radiator Valves are available in a choice of either Angled or Straight. (Please select from drop-down menu below).